Tamworth Castle gratefully accepts donations and bequests that conform to our 'acquisitions policy'. Without the generous and thoughtful donations made by people over the years, Tamworth Castle would not have such fine collections with which to support its aims of promoting lifelong learning, access, enjoyment and inspiration. Unfortunately there are limitations to what we can accept, and these are laid out in our acquisitions policy. 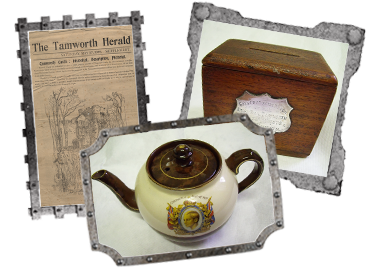 We only collect material with a Tamworth provenance (origin) so that our collections remain relevant to local people. We do not collect material that is in a particularly poor state of repair that would require significant sums invested in conservation of the objects. We do not collect duplicates of mass produced items such as flat irons, typewriters, beer bottles, etc. We have limited storage space for our reserve collections, which means we have to be very selective in what we accept. If you think you have something that we might be interested in please contact us to discuss it further. Often it is necessary to bring the items in to Tamworth Castle’s Collections Officer who will provide you with a receipt while we make a decision over whether to accept or decline the offer.